Of course, it only made sense that this morning Ethan woke up with a cold and I woke up with some killer body aches, chills and an awful sore throat. I feel like my head is a balloon being propelled fifty feet above the rest of my body and Ethan is hobbling around the house with his Spiderman bandages and shoving pieces of watermelon into his mouth. Neither of us felt compelled enough to wear pants today. We're a sight for sore eyes, let me tell you. Anyway, before the horror of fifty thousand gallons of blood spurting sprinkler style out of my toddler's body, we made muffins. They were delicious muffins and a couple of people asked me to post the recipe, which I had fully intended to do last night but then, you know, it didn't happen. A friend of mine had posted about Weelicious Parsnip Muffins on Instagram. I had two parsnips just begging to be used before they must be thrown out in our produce drawer, leftover from soup I had made last week. My only issue was that I didn't have all of the Weelicious ingredients on hand (like the creamcheese filling) and I had wanted to make them gluten free so my husband could eat some, too. (In hindsight this was a bad move because he somehow ate all of the muffins last night and Ethan was less than pleased this morning about this.) I also had some carrots I needed to use up, so I added those, too. With a few alterations to fit the ingredients we had on hand -- as a grocery store trip with a snotty, coughing kid is not my idea of a good time -- we put together a batch of Parsnip Carrot Muffins that were surprisingly delicious. 1. Combine flours, baking powder, baking soda, salt, nutmeg and cinnamon in a large bowl. Whisk to combine. 2. Combine yogurt, eggs, oil and vanilla in another bowl. 3. Stir parsnips and carrots into flour blend and pour mixture into wet ingredients. 4. Pour into muffin tin and bake for 25 minutes at 350 degrees. I've heard it all when it comes to nicknames meant as references to the way in which my child devours food. "There's Ethan, the bottomless pit!" "Oh, Ethan, you're a human garbage disposal!" It's true. I've been this boy's mom for over two years now and he still manages to stun me at every meal when he's shoving broccoli into his mouth with both fists and I'm skirting my husband's eyes so he doesn't sarcastically try to quiz me on why there are no vegetables on my plate. I'm a picky eater. I've always been a picky eater. My sister isn't a picky eater. She's always all "just try the sushi" at me as I sit with my head on the table sobbing at the mere thought of fish coming on contact with my face. We were both raised by the same parents. We had the same mother who always made sure to stock the 'fridge with organic milk and bore us at the dinner table with a rundown on the latest nutritional study she saw on Oprah. It hasn't been until lately that my mother has given in and let my sister stock the pantry with food she never would have let me even stare at down the grocery store aisles and, even so, my sister is the better eater of the two of us. 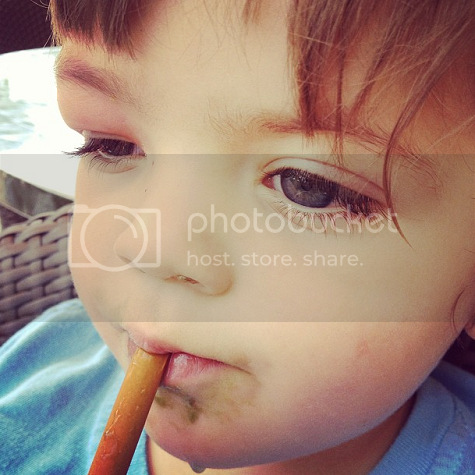 What I'm getting at is, I don't think there is anything that I did to grant Ethan with these magical eating abilities. I think, as with many things in parenting, it was just luck of the draw. The dice was rolled and it was determined I'd have a kid who loves to eat but doesn't seem to require sleep and so my 'fridge is always empty and there are always bags under my eyes. It is what it is. People are always asking me how they can get their little ones to eat more like Ethan and I'm always quick to shrug. That's my only answer, a simple shrug because, well, I have no idea how to get anyone to eat like Ethan or I wouldn't still be picking the chunks of tomatoes out of the pasta sauce before I eat it. We don't offer junk. Ethan doesn't boycott a plum in protest for being turned down some sugary cookies or candies because he doesn't know any better. We only keep healthy food and snacks in our house. When he requests a snack, he is more than welcome to browse the 'fridge or pantry and choose whatever it is that strikes his fancy. 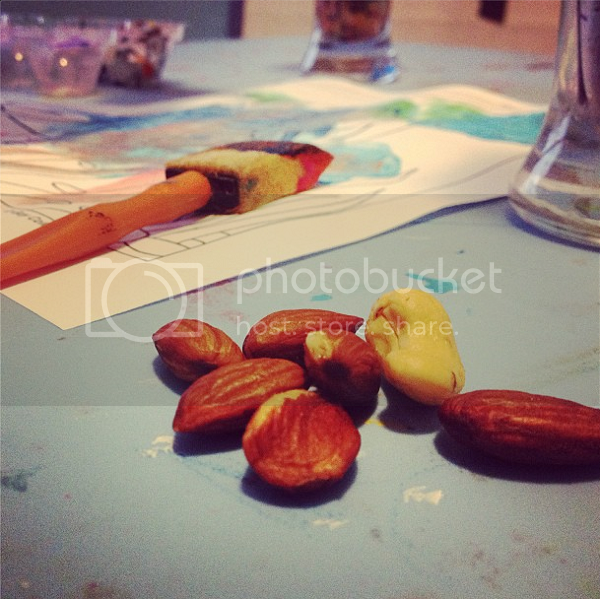 This is either some kind of fruit, veggies with hummus or nuts. These are the foods that Ethan affiliates with snack time and so I'm more than happy to let him make his own selection as he sees fit. If we are at a birthday party and cake is being served or at a grandma's house ten minutes after she pulled a tray of freshly baked cookies out of the oven, he's more than welcome to enjoy a sugary, delicious treat. I'm cool with moderation. I don't think a slice of birthday cake or a chocolate chip cookie is going to ensure your untimely demise. When we get back home, he's still going to be faced the capability to only make healthy choices and therefore knows that these special treats are just that: treats, and they're not meant for everyday snacks. We don't offer juice. I'm part of enough mom forums online to know that I've just opened a can of worms known as The Great Juice Debate. I've found there is some confusion that simply because a juice is "organic" it is suddenly healthy. "Organic" and "healthy" are not synonymous. Organic juice still contains a lot of sugar and, frankly, it's just not something that I'm comfortable giving to Ethan. I remember at one of Ethan's earlier pediatrician well visits, maybe it was his one year, I was all but crying about how everyone else's kid was drinking all of this milk and poor Ethan only wanted to drink water. 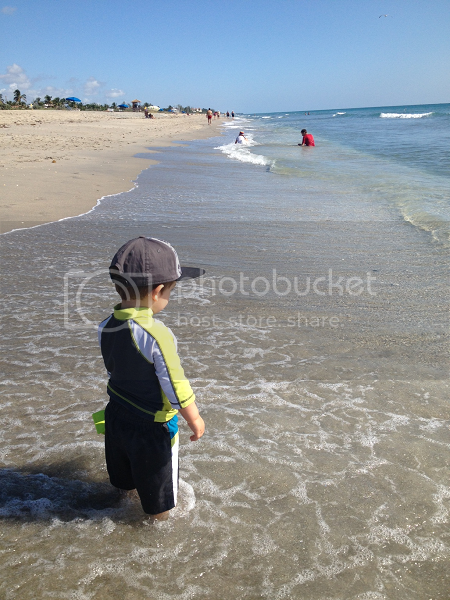 The pediatrician laughed and told me that water was the best thing for him. That's always stuck by me. Some mornings, Ethan asks for a small cup of milk, but usually he just asks for water. The concept of milk drinking in the afternoon or evening hours isn't one that would ever cross his mind and instead he knows we drink water during the day. I'm also not entirely sure he knows what juice is in a sense other than squeezing an orange into a bag and sticking in a straw. I'm sure that one day he will be at a friend's house or school and be faced with this great, new thing called juice and he will want it but that's okay, it can be saved for these special occasions and instances. This is a juice-free house. I involve him in the food selection and the cooking process. I've started to love going to the grocery store alone. 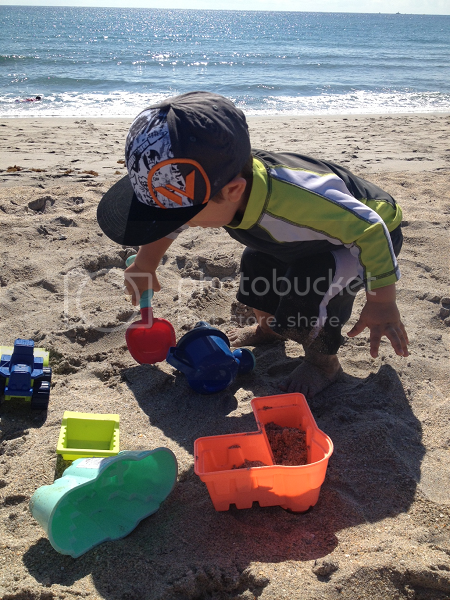 It is almost like a vacation after a busy week of playing sole caretaker to my precocious little two year old while my husband is at work. On Sunday afternoons, I can leave Ethan with his daddy and sneak out of the house to browse the aisles and check my grocery list twice to make sure I haven't forgotten anything. Still, when it comes to buying food, I like to try to involve Ethan in the process every once in a while. If we're strolling through the produce section and he sees something that catches his eye, it is always exciting for him to go home and help me prepare it. There are some evenings when Ethan would rather wreak havoc on the house (and cats and furniture) than help me cook dinner, but sometimes he really enjoys it. No matter how much longer the process takes with my tiny helper, I always make sure to extend the invitation for him to help me cook. This isn't limited to dinner, but also breakfast and lunch. 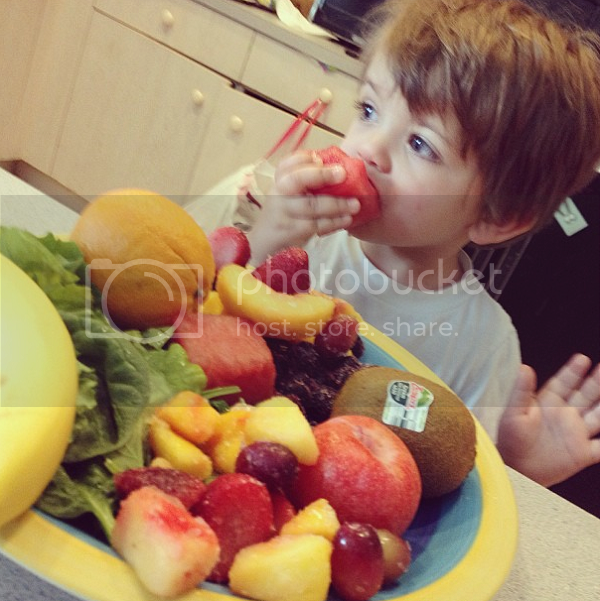 He especially loves to help me prepare smoothies in the morning and loves choosing produce from the drawers that he wants to "mix up round and round" to make his smoothie. Sometimes I chop and prep ingredients ahead of time and ask him to help me combine and mix, which always makes him feel like part of the process. He loves eating food that he helped make. We say no to kids meals. 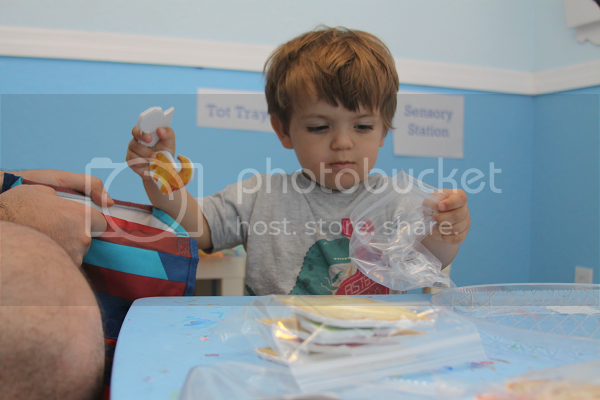 When Ethan was younger, I always used to share my weekly toddler lunches. Especially when you're always on the go like we were (are), having lunches planned and packed is a must. However, the idea of having two different dinner options never crossed my mind. Once he was finished with purees, Ethan ate whatever we ate for dinner, albeit in tinier quantities. I don't really believe in "kid food" and we never ate our regular dinner while Ethan set next to us eating chicken tenders or macaroni and cheese instead. This wasn't some kind of rule I decided to enforce one day, but rather the way it always just was. Dinnertime means dinner for all of us, as a family, eating whatever I cooked for dinner that evening. Say yes to spices. I'm known to shake on the cumin with a heavy hand. Freshly minced garlic, pepper -- the spicier, the better. Ethan has developed quite a taste for spicy food and has no trouble polishing off his food at Chipotle. When we were still doing purees or first finger foods, I always made sure to use spices and seasonings to give things more of a flavor. I still shrug and stick by my original sentiment that when it comes to his eating habits, really, it's just the luck of the draw. And if you're a parent with a toddler who refuses to eat but sleeps through the night and wakes up with the sun and not before it? You're still winning at life in my book. So, I'm not really sure what went on during L week. My husband had off from work. 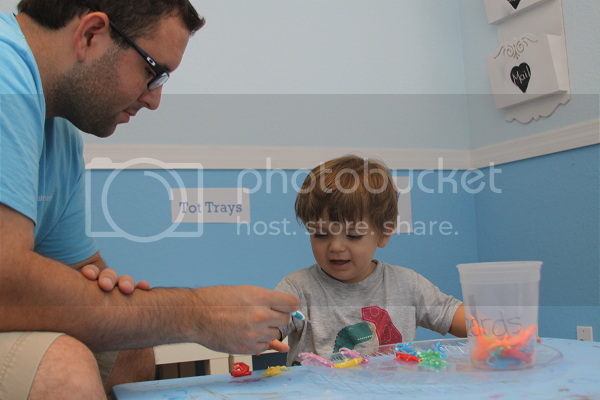 I initially thought that Ethan would love having daddy around for our tot school time but, in actuality, he seemed to really hate to share the time with the both of us. It had to be one or the other doing tot school with Ethan and, since he's never home and this one week was his opportunity, my husband won. Ethan all but kicked me out of tot school whenever I dared enter the room. 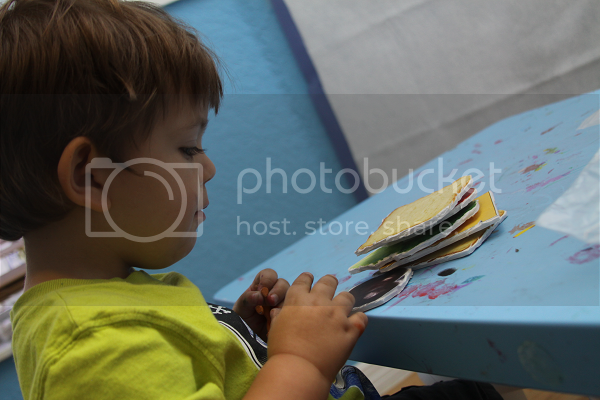 The trays weren't really utilized in the ways I'd intended, but Ethan really enjoyed himself over the last two weeks. 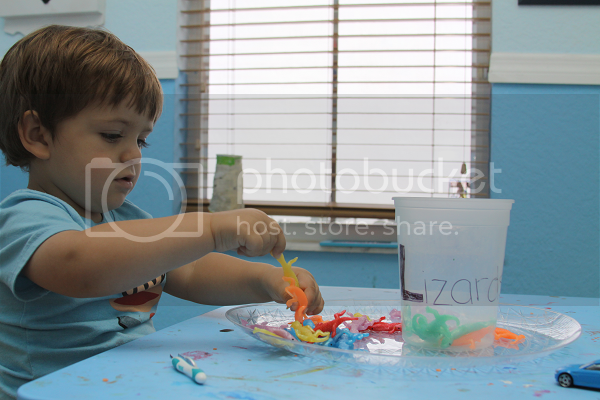 He and his daddy had a blast doing tot school together and, really, that's what counts. 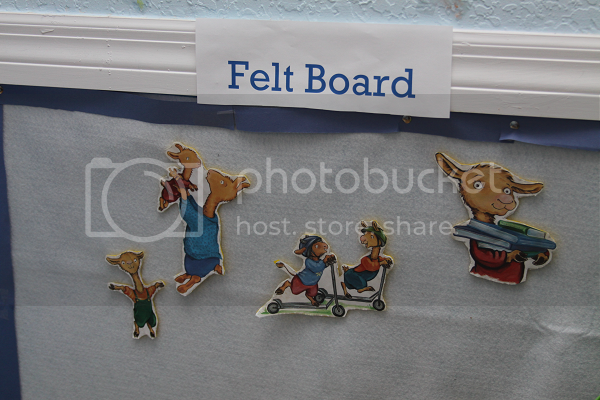 Ethan never likes the felt board so I was hoping the Llama Llama characters would help. I printed out the photos on regular paper and glued them to some felt. I went overboard on the glue and it made them a little heavy, so Ethan kept going nuts when the "llamas fall down on floor!" But he did get a kick out of the llamas. 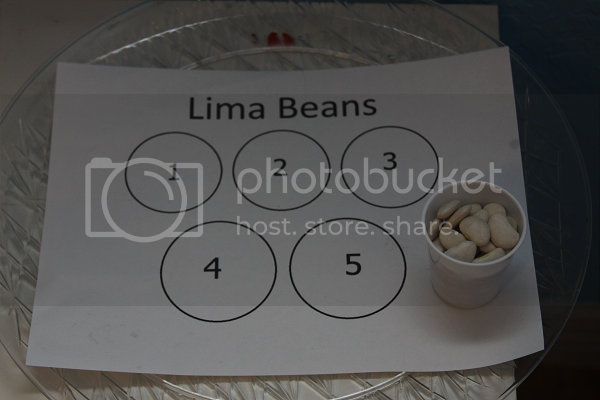 I'm fairly certain this tray didn't even get used, though I did spend a great deal of time sweeping up the lima beans that wound up on the floor. 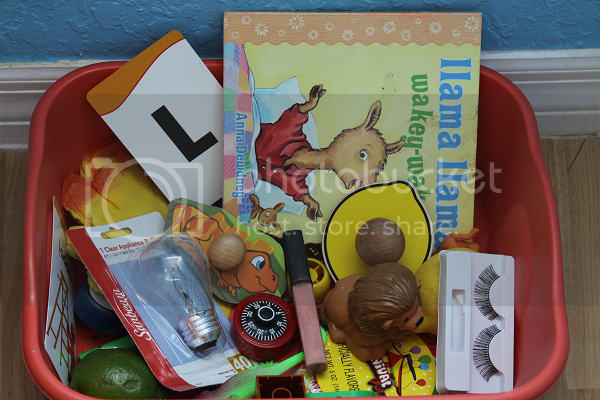 I put together a discovery bin with various L items. Ethan really, really enjoyed this bin. 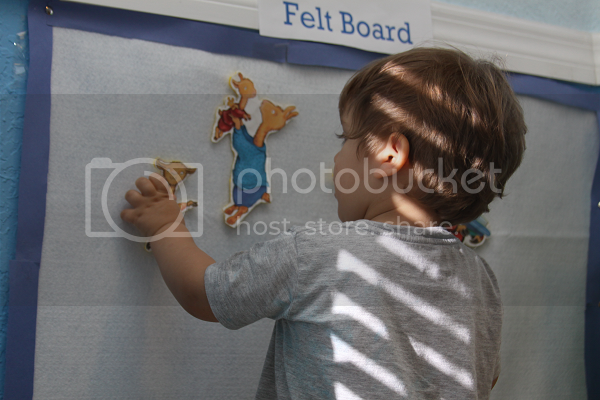 Once daddy went back to work, he asked to spend every moment in tot school playing with this -- especially the locks. The L week magnet board was a big hit, too, as the magnet board usually is. This was probably the last activity for Ethan to get tired of. He would refer to the lamp as a light and get a little mixed up with the light bulb, but he had a lot of fun practicing all these great "L week" vocabulary words! 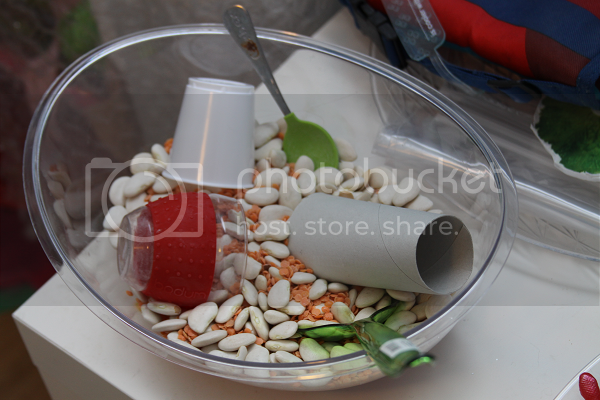 I thought this activity would be a fun way for Ethan to use his creativity and also get some practice with practicality by learning to make his lunch. He loved this tray! 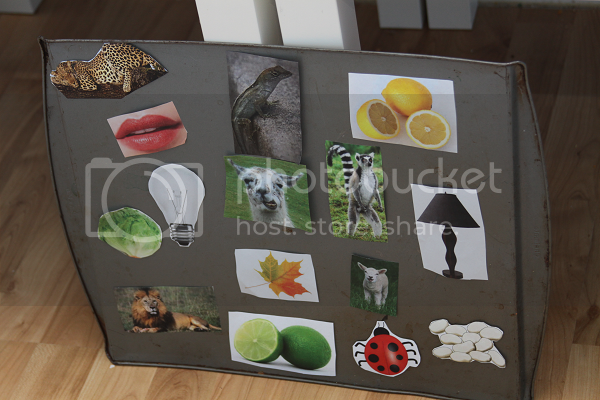 To make it, I printed out some photos of some lunchtime favorites (bread, cheese, lettuce and tomato slices plus a plum, some Organicasaurus dinosaur snacks, carrots and hummus. I attached these to some foam board and then cut them out. 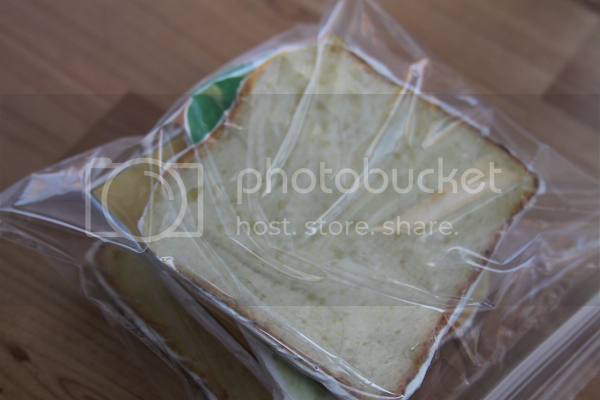 I added little velcro attachments to the backs of the sandwich items so he could put his sandwich together as he pleased. 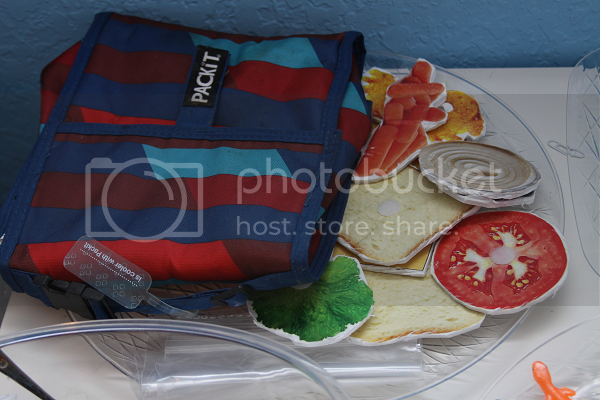 I also included a couple of sandwich bags and a lunchbox for him to create his lunch. 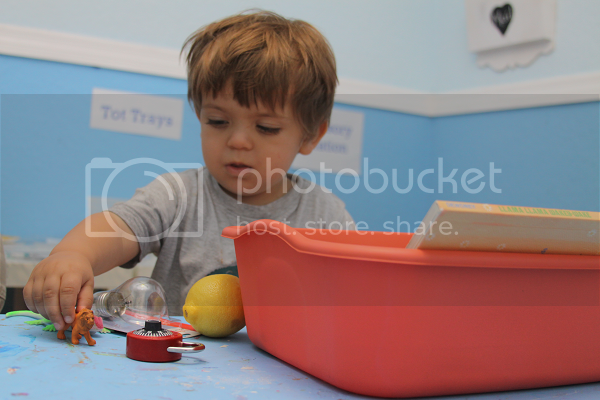 He loved to do this tray, especially build his sandwich! I had some extra lentils and lima beans leftover, so I just put them into a bin with some cups and scoops and let Ethan go nuts. 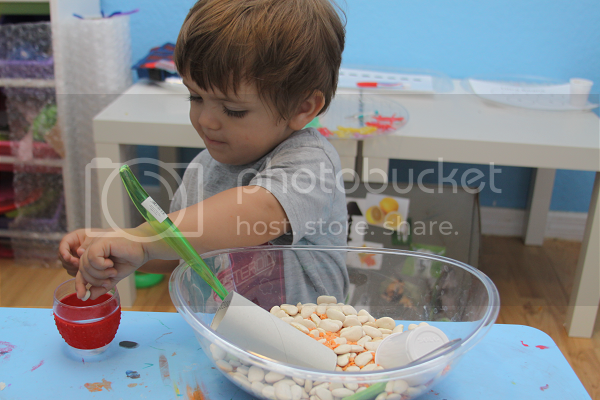 He loved using his imagination to play with this bin, especially scooping and honing his pouring skills! Oh, the lizards. 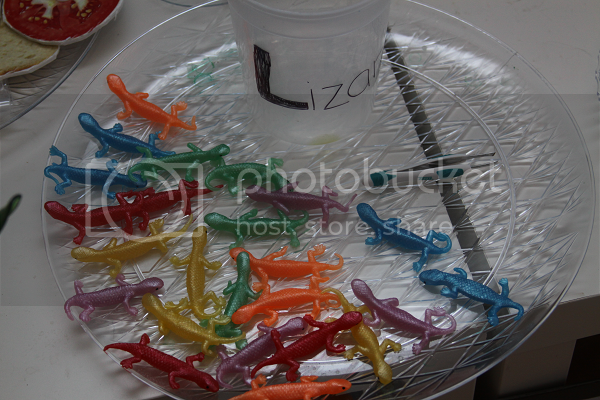 Lizards, lizards, lizards. I thought Ethan would love this tray, and he did. Sort of. I found these bags of sticky lizards two for $1 in the Target party favor aisle and knew they would be great. What I wasn't counting on was for our beloved tongs to break (why did I only buy one set? Kicking myself now!) and be completely unable to find a replacement. I may have shed actual tears over this, I'm just saying. As a last ditch effort, I picked up a small pair of tweezers to introduce Ethan to in lieu of the tongs. He wasn't happy. He wanted tongs. He knew we were practicing with tongs. In the end, he simply became obsessed with playing with the lizards. 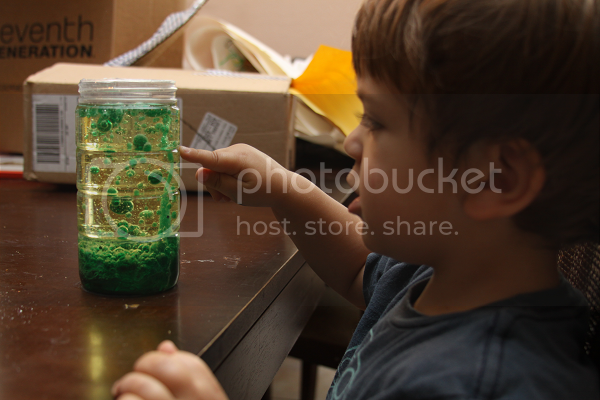 He and his daddy spent the entire week just playing with these lizards. I'm still finding them in bizarre places throughout the house, like in the refrigerator. So, technically, this tray was still a huge hit. 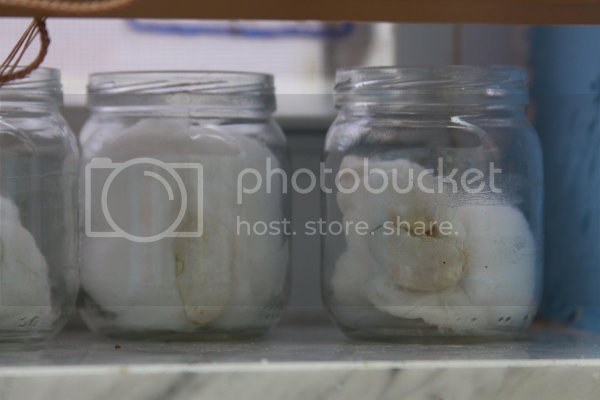 We wet some cottonballs and "planted" some Lima beans in jars on our window sill. They're still...deciding if they want to sprout. One seems like it's going to sprout up any day now but the others don't seem so promising. I will continue to post updates of their growth. My husband says they're not getting enough sunlight on the side of our house, but I'm convinced I'm just this bad at growing things. To be continued! 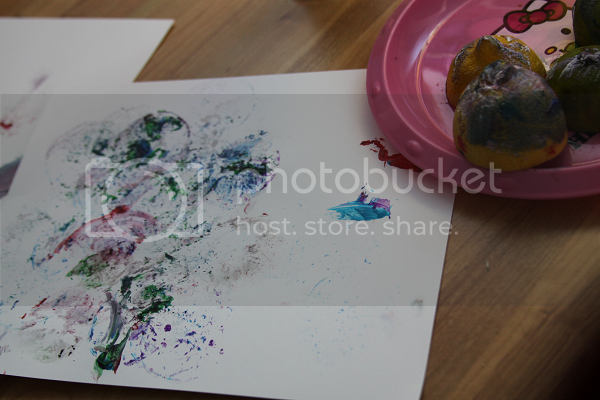 This activity was a huge hit! We spent a solid hour repeatedly setting our little lava lamp off. To make this, take some clear container. We used an empty Parmesan cheese container. 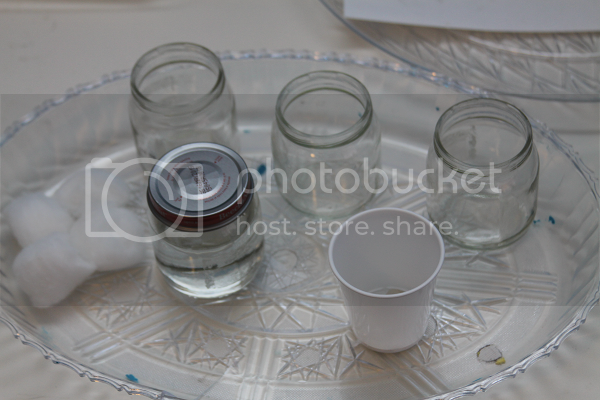 We filled it 3/4 of the way with vegetable oil and the remaining 1/4 with water. 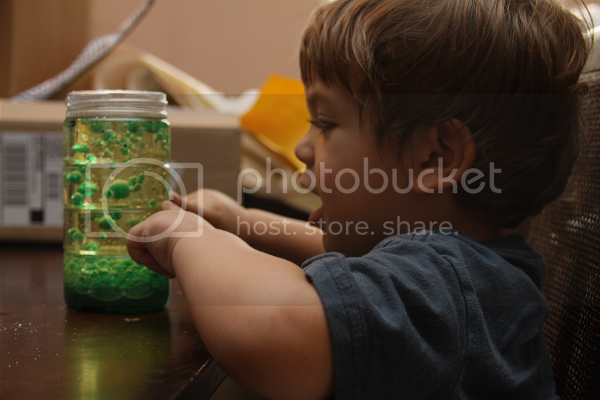 We added ten drops of food coloring -- Ethan chose green -- and then dropped in pieces (one half at a time) of Wal-Mart brand Alka Seltzer tablets. 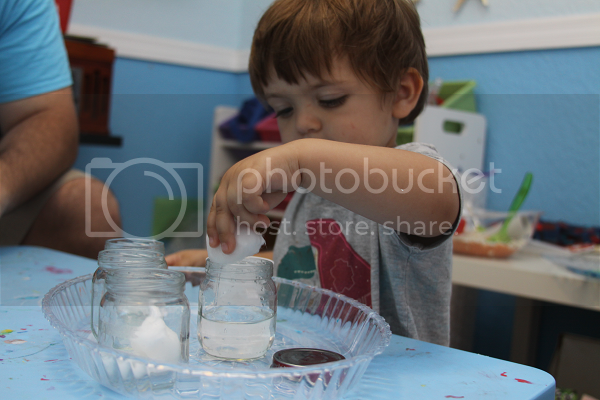 Ethan was absolutely mesmerized with this activity! As usual, L week was packed with art. Ethan has really been into markers lately, especially. 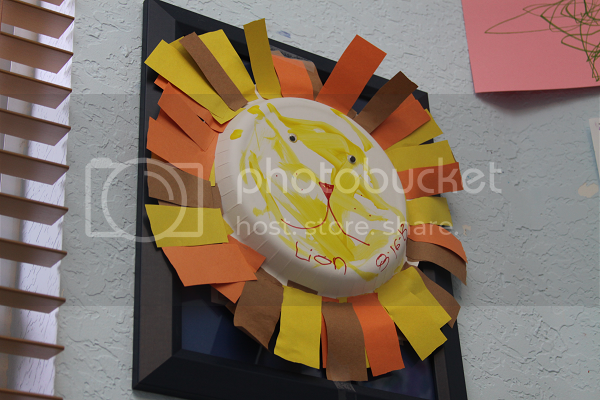 His favorite art activities we did this week was our paper plate lion. He loved gluing on the strips of paper to make the mane and, of course, putting on the eyes. The lemon and lime we used in our sensory bin were going bad, so Ethan did some stamping with them. 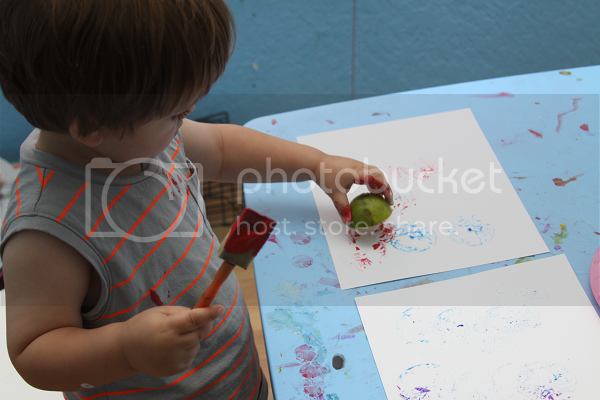 He also loved painting the lemon and lime themselves, too. I am really good at dwelling. It is one of my greatest skills, keeping myself up into the wee hours of the morning slathering on the guilt and worry and unnecessary (and oftentimes irrational) concern for situations that likely only exist in my mind. You know, like the stale already if I do or don't give Ethan a sibling now then I am selfish and ruining his life because we have no family routine that I've perfected at this point, every last cranny explored and analyzed. The fact that we have a small family is always a sore spot. I am openly envious of large families with siblings and aunts and uncles and cousins and family reunions and trips and holidays. But what I constantly miss when I spend my time daydreaming about what I don't have, what I can't give to my child just by having another child sooner than we had anticipated, are the amazing people that walk in and out of our lives regularly. I pointed out to my husband the other day how many ridiculously interesting people we've met, be it once or twice or just know and regardless our lives are somehow bettered by them. Or changed, or inspired in some way, the littlest way. The artists and creative souls who are always busy making and doing and creating a world that I am glad to be a part of. While our family tree is small and bare and comprised of a few weary branches, there are so many people in our lives that my child can learn from. There are so many people that I'm willing for him to see and meet and watch and say this is what I want to be like. It is no secret that my greatest hope for Ethan is to follow his dreams and be who he is, who he really is, whoever that may be. Whether this means college or doesn't, whether this means a musician or a lawyer or both, my ultimate goal is for him to know both happiness and himself. I realized recently how rich our lives are in knowing so many amazing people who do so much so beautifully. That for every "how does your husband feel about Ethan painting? 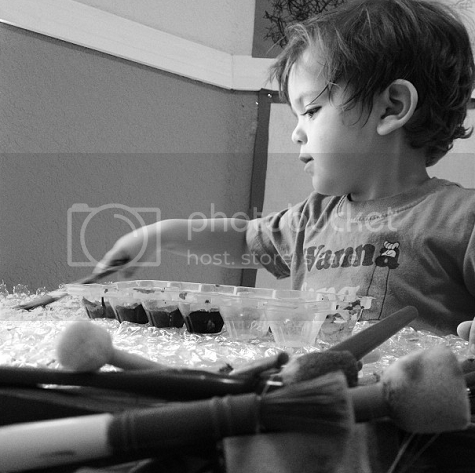 I bet he wishes he could go out in the yard and kick a football" there is also a "this is a beautiful painting, Ethan! Can I keep it for my wall?" For every bit of ugly that exists that makes me feel oppressed and misunderstood and frustrated on a regular basis, there is so much beauty. And so much good. And so many people with beautiful, creative hearts and inviting souls that help lift it all up for me when it all feels like too much, even if they don't know it. Even if I've met them once or twice and simply click through their names through social media. Even if they read this blog regularly or don't know of it's existence at all. Even if they live far away and visits are far too few. How lucky we are. How lucky Ethan is. How lucky the world is for these little bits of sunshine, light and beauty when the world feels all too dark. Sometimes you will live in Southeast Florida in the suburbs surrounding the Florida Everglades where Mosquitos are an everyday nuisance. It would only make sense that then your child winds up allergic to Mosquito bites. And sometimes Benadryl and one percent hydro-cortisone creams and hard, swollen welts aren't enough fun for one day so a particularly annoying Mosquito takes it upon itself to sting your child on the eyelid on the twelve step walk from the car into your garage. Sometimes this one bite in particular will be just enough to cause a cellular infection in the skin around your child's eye so they wake up for you to find their eye nearly welded shut. Sometimes this will happen within minutes of your dentist appointment. This means you get to sit in the dental chair shvitzing about having to do your every-three-years dental x-rays while neurotically checking your phone to see if your husband and child have made it to the pediatrician and, if so, what is happening with his swollen eye. The dentist will then likely tell you that your never had a cavity streak has ended at the ripe old age of 27 and, for fun, you've got two cavities to kick off this momentous occasion. Later that night while your child is freaking out about "booboo on eyebrow," a picture frame being stored in his closet will shatter onto the wood floor. As you're trying to clean up the shards without further incident, you will hear another shatter come from down the hallway. Of course, your two year old will decide this is a splendid time to climb up on the table and select a glass to feed the cats with. Sometimes you will cry a lot and silently curse the bottle of Benadryl and antibiotic because your two year old no longer believes they are magical cake juice and he refuses to take them. Sometimes 9 o'clock seems like a perfectly decent bedtime. What's cooler than dinosaurs? Not much, apparently. 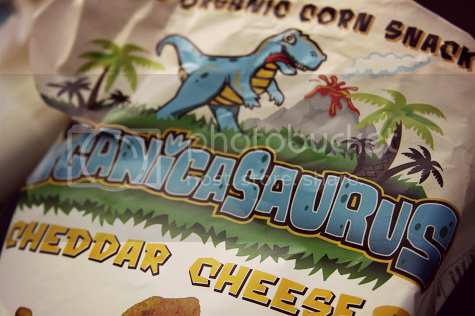 These Organicasaurus snacks by Good Boy Organics are a huge hit around our house. Where I usually get "greenbeans" or "burritos," Ethan has started requesting "dino snacks" when I ask him what I should make for dinner. He's not going to win the dinner debate, but he does look forward to snacking on these baked corn snacks during snack time, and I'm totally cool with offering these as a snack! In addition to the totally adorable dinosaur shapes, these non-GMO verified, USDA organic, certified gluten free snacks are packed with real cheddar cheese and pack a huge crunch in every bite. 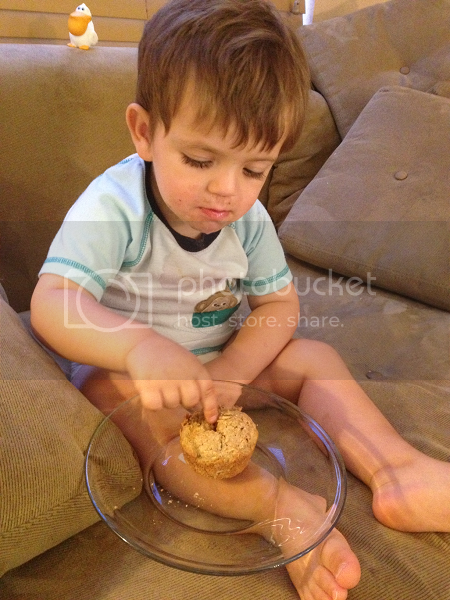 Ethan loves seeing how big of a crunch he can make as he munches on these snacks! 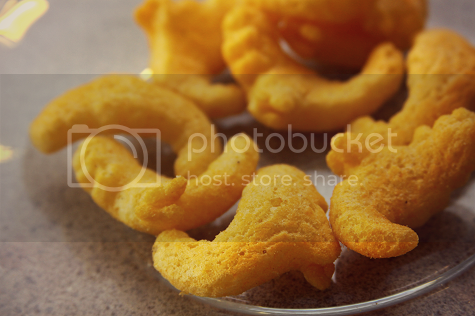 Organicasaurus are the only USDA organic cheese puffs on the market, but the goodness doesn't stop there. They're baked instead of fried, and I was really impressed with their overall ingredient list, which includes actual spices like onion and garlic powder, rather than artificial flavors. 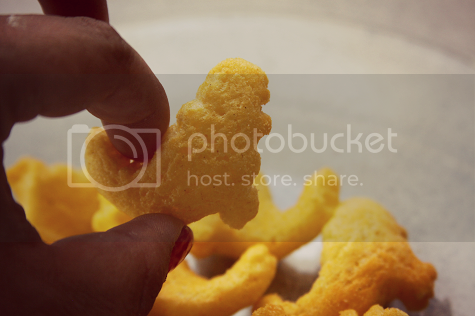 The Organicasaurus snacks are actually a pretty decent size which makes it a fun snack for imaginative toddlers, too. Ethan loves to use his imagination and make his dinosaur snacks walk across the table or make silly noises before he eats them (that's way cuter than it sadistically sounds!). Because these snacks are gluten free, my husband is able to get in on the snacking, too. Because he has Celiac disease, I feel like he never gets to enjoy a whole lot of the yummy snacks that we bring home. Not only can he enjoy these with Ethan, but he does enjoy them, and admits they're pretty good. It always makes my heart happy to know that there are actually delicious gluten free snacks on the market for kids who want to enjoy some healthy-but-still-tasty snacking, too. Speaking of healthy-but-still=tasty, that's exactly what these snacks are. I'm a little bit (okay, a lot bit) neurotic about what Ethan eats, especially when it comes to quick snacks, and I love that Good Boy Organics keeps the little ones in mind with these fun Organicasaurus snacks! 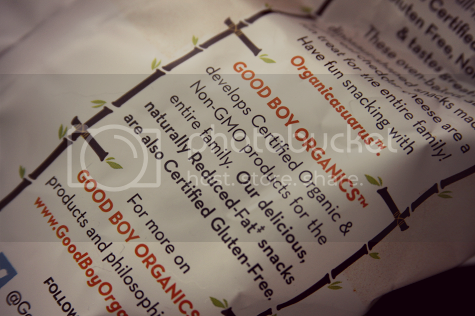 Good Boy Organics are also the brainchild behind BOPS -- or Baked Organic Potato Snacks -- which are also certified organic, gluten free and non-GMO verified! With 65% less fat than your regular potato chips, these baked-and-not-friend snacks are a healthy snack alternative! BUY IT: Try these out for yourselves by picking up a bag (or two, or three) wherever Good Boy Organics products are sold! WIN IT: The kind folks at Good Boy Organics are offering one of my readers the chance to win a case -- 12 bags! 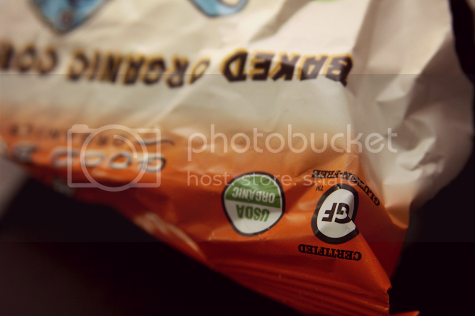 -- of Good Boy Organics snacks! The case includes four bags of Organicasaurus Cheddar Cheese Puffs, two bags of BOPS Sea Salt, 2 bags BOPS SourCream & Onion, 2 bags BOPS BBQ and 2 bags BOPS Aged White Cheddar! So awesome, right? The giveaway is open to US residents and ends September 5. Good luck! 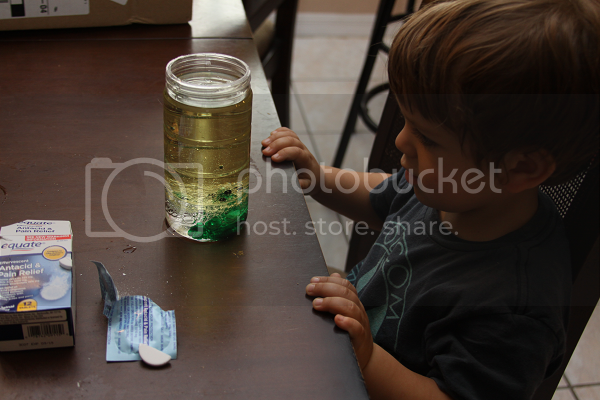 a Rafflecopter giveaway Ethan received these Good Boy Organics "Organicasaurus" snacks to facilitate a product review. No compensation was provided and all opinions expressed are completely my own -- and his, too.